It’s so funny, the way that the heart remembers. I was a little girl of about four years the first time I recall traveling to my Gra’ma’s house in Kasota, Minnesota. Daddy would turn right at the corner by Jim Klein’s Garage (at the bottom of the hill entering Kasota) and my heart would skip a beat. There, up ahead, I could see the black-oil covered railroad track crossing that led to Gra’ma’s, and my little sister and I would scream with excitement and delight. As we drove from the make-shift blacktop road onto the gravel road immediately preceding the old railroad crossing, the scent of wildflowers filled our nostrils and I was certain we’d all just died and gone to heaven! Up and over the railroad tracks with a very sharp turn to the left we’d go, then down Gra’ma’s long gravel driveway. Before very long, Mama, my sister and I were living on Gra’ma’s property where we were surrounded by lilacs, sumac bushes, Vogt’s enormous horse pasture and the bull pasture, too. My little sister and I would spend endless hours, days and then months playing in that horse and bull pasture. 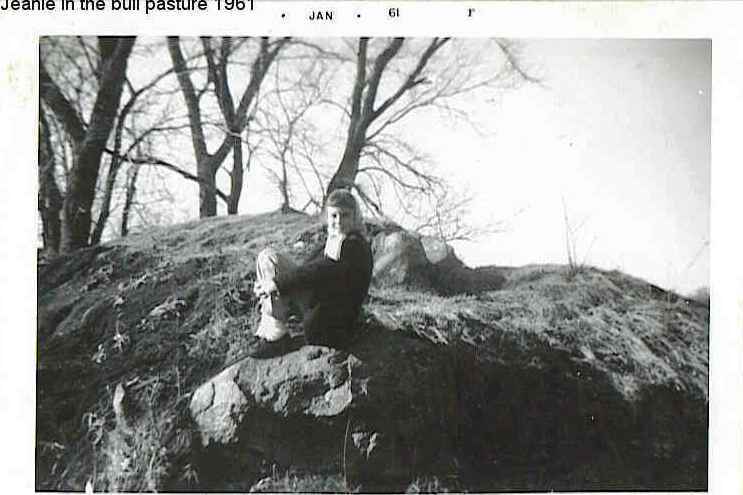 The Vogt girls would sometimes give us a ride on “King” one of their horses, and we’d build imaginery forts in an old abandoned quarry that was located a little ways away in the bull pasture. I sometimes crossed the railroad tracks to visit a dear little elderly man who seemed to enjoy cooking food for me. Mr. Rollings was a kind and warm person, who, just before leaving their little house across the tracks, gave me a card in which he’d written, “To the little girl who never forgot”. I miss him to this very day. My little sister and I loved to pick wildflowers and take them to the Old Rest Home that sat kitty-corner from the Rybus home. (Sadly, the old rest home is no longer standing.) All of the elderly folks who lived there would always smile happily when they’d see us come in. I began walking to the old Kasota School (no longer standing) that stood across the street from the Old Kasota Post Office when I entered Kindergarten. The school was massive in size, but my kindergarten teacher, Mrs. Kruse, made it’s interior a warm, and happy place. Upon entering the first grade at John Ireland School in St. Peter, MN, it became necessary for me to ride the school bus. I would wait for the bus in front of the Old Kasota School most mornings, except when the winter weather grew very blustery and cold. On those frigid mornings, Mr. and Mrs. Barklow (who ran the post office) would always let my little sister and I wait inside by one of the post office windows for our bus. There were many kind people living in our little town. I frequently return to Kasota just to visit and to reminisce. So much of my heart remains there. It was the ideal place for children to experience their childhood and to develop wonderful imaginations. Although I very much love my life today in Lakeville, Minnesota, I know that the very special small town of Kasota will always draw me back into it’s heartwarming, nostalgic embrace – even if only for a few minutes at a time.